About 32 companies, including Apple and Microsoft, have signed onto an amicus brief supporting the rights of a transgender student in the Adams v. School Board of St. John’s County Florida case. The lawsuit concerns Drew Adams, a transgender boy who was denied access to the boys’ restroom at his high school. Adams has been presenting as male since 2015 and was allowed to use the appropriate facilities during his freshman year. But after an anonymous complaint, he was told he’d have to use only a gender-neutral restroom on campus. 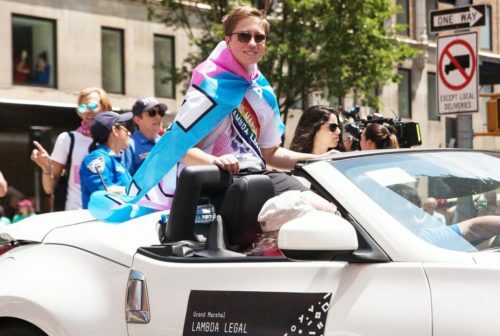 Adams, via Lambda Legal, sued the St. Johns County School Board of St. Augustine, Florida, claiming that they violated the Equal Protection clause of the U.S. Constitution’s 14th amendment. In barring him from using the boys’ restroom, they violated his right to receive equal treatment under the law. On July 26, 2018, Adams won his case in U.S. District Court, but the school district is appealing to the 11th District Court of Appeals. To support Adams, an amicus brief—also known as a “friend of the court” brief—was authored by law firm BakerHostetler, and signed by 32 tech, health care and other firms. In addition to Apple and Microsoft, the other companies who have signed onto the amicus brief include Airbnb, Asana, CREDO Mobile, Deutsche Bank, eBay, General Assembly Space, GitHub, Glassdoor, GlaxoSmithKline, Google, IBM, Indiegogo, Kaiser Permanente, Knotel, Levi Strauss & Co, Linden Research, Lyft, Mapbox, Marin Software Incorporated, MassMutual Life Insurance Company, Mitchell Gold + Bob Williams, NIO USA, Patreon, Postmates, Replacements, Shutterstock, Spotify, Tumblr, Xerox Corporation and Yelp. The brief argues that the policy, if upheld, would harm the transgender employees of their companies, as well as those who are parents of transgender children. They further argue that such a transphobic policy would harm their ability to build and maintain a diverse and inclusive workplace. Several of these companies also took to their social media accounts to highlight their support of transgender people and announce their involvement in the brief.